248 Oct. 1946 The W.C.T.U. 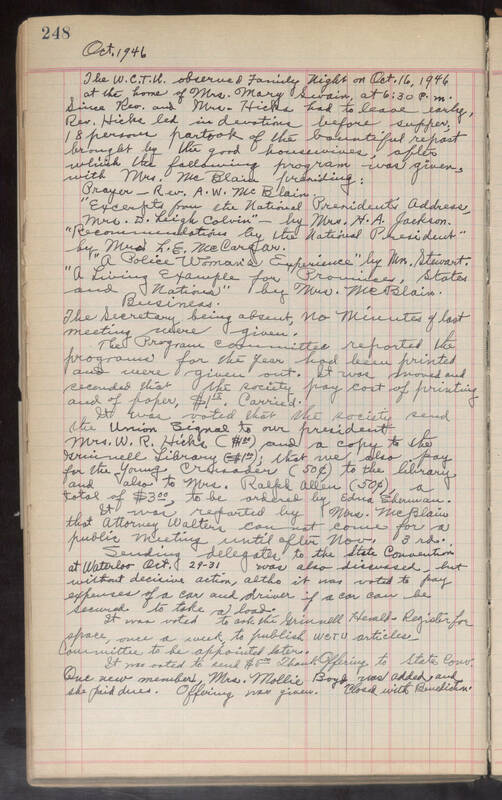 observed Family Night on Oct. 16, 1946 at the home of Mrs. Mary Swain, at 6:30 P.M. Since Rev. and Mrs. Hicks had to leave early, Rev. Hicks led in devotions before supper, 18 persons partook of the bountiful repast brought by the good housewives, after which the following program was given, with Mrs. McBlain presiding: Prayer, Rev. A. W. McBlain. "Excerpts from the National President's Address, Mrs. D. Leigh Colvin - by Mrs. H. A. Jackson. "Recommendations by the National President" by Mrs. L. E. McCargar. "A Police Woman's Experience" by Mrs. Stewart. "A Living Example for Provinces, States and Nations" by Mrs. McBlain. Business: The Secretary being absent, no minutes of last meeting were given. The Program committee reported the programs for the year had been printed and were given out. It was moved and seconded that the society pay cost of printing and of paper, $1.15. Carried. It was voted that the society send the Union Signal to our president Mrs. W. R. Hicks ($1.00) and a copy to the Grinnell Library ($1.00); that we also pay for the Young Crusader (50¢) to the library and also to Mrs. Ralph Allen (50¢), a total of $3.00, to be ordered by Edna Sherman. It was reported by Mrs. McBlain that Attorney Walters can not come for a public meeting until after Nov. 3rd. Sending delegates to the State Convention at Waterloo Oct. 29-31 was also discussed, but without decisive action, altho it was voted to pay expenses of a car and driver if a car can be secured to take a load. It was voted to ask the Grinnell Herald - Register for space, once a week, to publish WCTU articles, Committee to be appointed later. It was voted to send $5.00 Thank Offering to State Conv. One new member, Mrs. Mollie Boyd was added and she paid dues. Offering was given. Closed with Benediction.